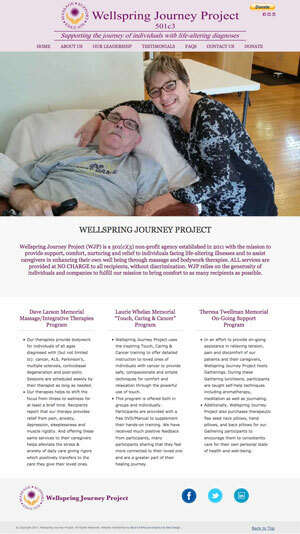 Blue’s ArtHouse has just completed a redesign for Wellspring Journey Project, a nonprofit organization that provides therapeutic massage to people who are facing life-altering illness and to their caregivers as well. We have been providing maintenance for WJP since early this year and their original WordPress theme was in dire need of an overhaul. We are so honored to be working with this compassionate and soul-healing organization!